Providing you the best range of din 20022- 1sn (excees sae r1) single wire braid specification, din 20022- 2sn (excees sae r2) double wire braid hose, din 20023- 4sh four spiral tempered wire hoses, sae 100 r-6 single textile braid hoses and hydraulic hoses with effective & timely delivery. 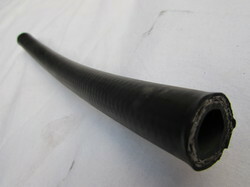 In tune with current market trends, we are offering excellent quality Hydraulic Hoses. Highly demanded for very high pressure and impulse hydraulic applications of lifts and cranes functionality, this hose is carefully developed to surpass the rigid industrial standards. Developed using premium grade oil resistant rubber with braided stainless steel wire, this hose can be ordered in application specific dimensions. We have marked a distinct position in the domain by manufacturing, trading and supplying a comprehensive array of Hydraulic Hoses. Due to its flawless finish and easy to use nature, the offered hose finds its application in industrial sector, commercial arenas and agricultural land. 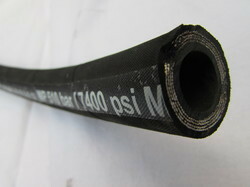 This hose is manufactured at our well-equipped production unit using quality raw materials with the help of latest techniques by our deft professionals. 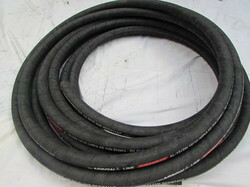 Apart from this, this hose can be easily availed from us at industry prices.